Denny Hamlin finished 2nd in the Championship standings after having some problems at the final race of the 2010 season. None the less, Denny’s fan’s are still rallying behind with a new Twitter trend; #11in11. Referring to Denny Hamlin winning the championship in 2011. 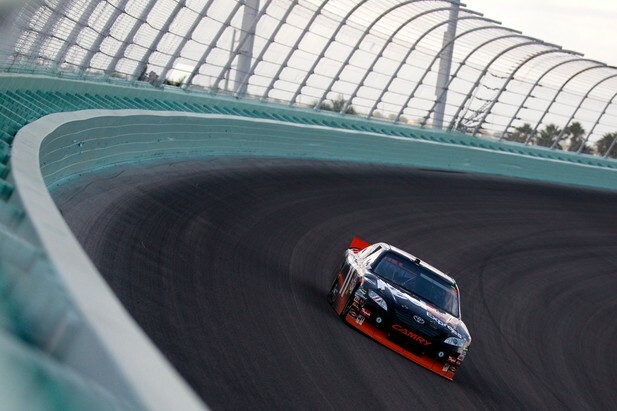 Denny qualified in the 38th position, but had a very fast race car in race trim for Sunday. The race started and it looked to be business as usual for the points leader. He quickly made his way up close to the top 10 and had a lightning fast race car. Denny would run into trouble, after coming out of the turn. Paul Menard did not clear Greg Biffle on the outside and it forced Biffle to turn down into Hamlin who was right next to him coming out of the turn. 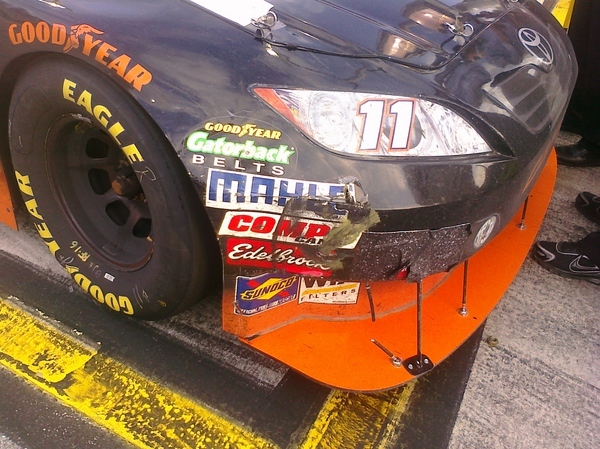 The incident sent Hamlin spinning through the grass and it gave him significant damage to the front splitter. Denny was only able to make it up to around 15th after that and was forced to come in and fix the splitter under yellow. After fixing the splitter, Denny flew up to the 6th position in front of Jimmy Johnson. The yellow would fly again, and during the pit stops, Denny lost ground to Jimmy Johnson and was forced to start outside of him. After starting outside, Denny was to loose to do anything and quickly fell back to 12th. Denny hung around 12th, and eventually short pitted for a green flag pit stop. 3 laps later the yellow flag flew. Johnson would remain on the lead lap, while Denny fell a lap down. Denny had to get the wave around and this would force him to not come and get tires. Denny had to start at the tail end of the lead lap and from here his championship hopes would be over. Johnson finished 2nd in the race and completed his drive for 5. Fortunately, Denny Hamlin fans have something to rally behind, that is 11 in 2011. Denny will finally dethrone Jimmie Johnson. He said he would be the man to do it. Go Denny!